One Night in "Bangkok" is One Too Many: Desperately Seeking The Point of "Point of Rocks"
Bruised, scabbed, and spent, Grey and Black water maxed out, we departed Joshua—exchanging surreal-ness, granite boulders, and solitary explorations for the searing heat, crowds, dust, and nothing-ness of the infamous Quartzite… the biggest RV Snowbird blight ever perpetrated upon a landscape outside of Florida. Unlike Bangkok, "One Night In Quartzite" is one too many. Having gone to the bother of driving 37 miles to Joshua'a south entry/Visitor's Center waaaaaay over on the opposite (and more desolate) side of the park—a journey that rivals a Mars mission if one abides the 35 mph speed limit—it made sense to go ahead and check off the 8 mile traipse to Lost Palms Oasis. Recall, that the primary goal was to frisk clues from some "loose-lipped," kinder-gentler Mr Ranger Sir, regarding the secret whereabouts of the old miner's campsite. Alas, sometimes my posts are in chronological order; sometimes they're not. It might have been on the first visit to Joshua, or maybe it was the second (there is a difference of opinions in our Lazy Daze rolling homestead). But, "when" is of little consequence to this story. You see, this is what happens to old married couples—mature relationships, then, if it makes you feel better. The cadence, buildup, and point of a good story goes down the drain when an interjection/argument breaks out over what, where, when or who the person was that told you something that relates to the story… ah, what was her name? started with a "B," Betty? Bonnie? Before you know it the audience is implementing emergency exit strategies… fake phone calls, pulling fire alarms, jumping out of second story windows! Anything to avoid Fred and Wilma's diversion into irrelevant minutia. Anyway, as I was saying, sometime between the mid to late 90's and the early 2000's (happy Bobbie?) we found ourselves immersed (aka, lost), deep in the throat of Joshua's labyrinth laced wilderness, when we stumbled upon something incredible. Lindsey was young enough to be my granddaughter. She was wearing tights, black as her midnight hair, and had an innocent smile. So I began to relax and play along, curious, more than anything, about her odd request for me to video her dancing… something that would embarrass most people to an early grave. Truly, it was a magical setting though—an array of assorted granite boulders, basking in the amber glow of a western sunset and flung across the landscape like pebbles from the hand of an angry god. If completely honest—less inhibited, completely alone, female, and had it been dark—I would have danced, too. But, even in my boldest, most intoxicated moment, would I ever possess the balls to ask someone to video me strutting my stuff on a boulder. What if it got posted and went viral? So I envied Lindsey's free spirit—her child-like nonchalance and forwardness. As with vices of alcohol and chocolate, it's good to put internet and blog compulsions aside once in a while to see if you've crossed over the blurry line to "addiction." 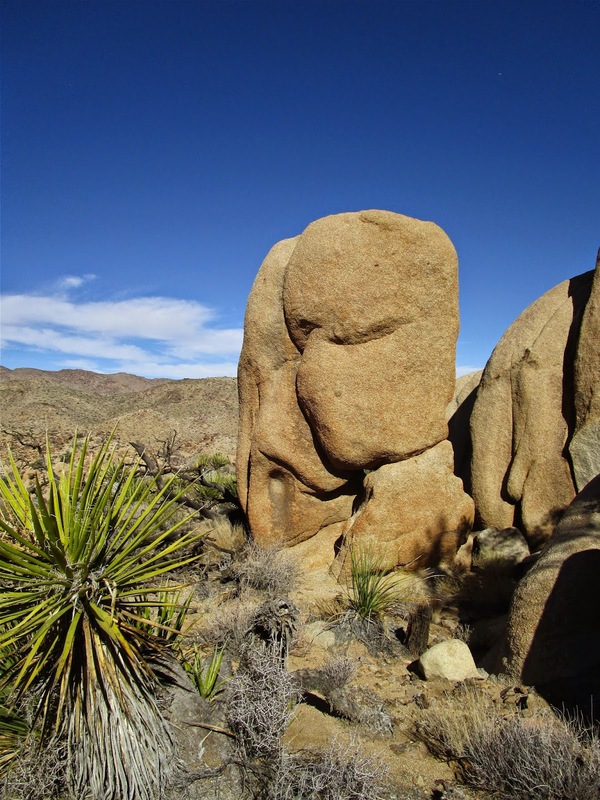 Joshua Tree National Park is an outstanding place to detox—to go "cold turkey"—for it has zero "bars" of Verizon. Not even Kareem Abdul "Wilson," our mighty signal magnet, could muster a connection with the World Wide Web of Malaise. And phones? Nope, no 911 net to break one's "fall," should they fall in Joshua. And trust me, there are no shortages of places to do just that. "Who is more to be pitied, a writer bound and gagged by police or one living in perfect freedom who has nothing more to say?"